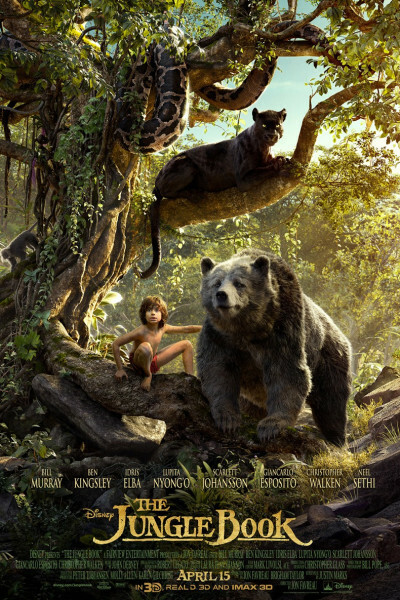 I'm kinda shocked: The Jungle Book is pretty dang good! I told Lauren, "This is either gonna be great, or terrible." No middle-of-the-road. I was fearing Dr. Dolittle's talking animals. The story, of course, is a classic. Can't go wrong there. The characters are great. Lots of variety and tension, precisely as you remember them. The CG work is remarkable. I commented to Dawn when it was over, "They're getting so great at this." One is never distracted by it, thinking "gosh, this looks so fake." Like in recent Planet of the Apes installments, it's simply seamless. The critters are real. The lows, from my point of view (and this is just a personal taste thing, so forgive me) are the musical numbers. I was really digging the movie until characters crooned. Granted, the songs are fun, heck yeah, but not quite here. They took me from a pure, cool, sorta emotional high place to something that felt jarringly goofy, inauthentic, off-kilter, like I was now joining 2002's The Country Bears. And I almost felt like Bill Murray knew it, choosing to barely sing the bear. I suspect they'd be great numbers in a broadway production of The Jungle Book, à la The Lion King, but I'd have preferred they simply not be in this film. The highpoint, beyond barely-there CG and the transfixing story (I really was rather captivated for most of the film) is the absolutely beautiful boy, Neel Sethi, whose materialization here—seemingly from mid-air—is jubilant. He's a virtual spider monkey, swinging, running and jumping as if in a reduced-gravity environment. It's balletic, and joyous to watch. You'll feel like Tarzan for much of the film, ready to roar. I could not help but recall the way I felt seeing Suraj Sharma in 2012's Life of Pi, in which a young, charismatic, unknown boy burst onto the screen and became a man through his relationship with a tiger in an equally immersive (though vastly more spiritual) CG cinematic experience. If you're on the fence about seeing The Jungle Book, perhaps fearing—as I did—that it'll be a silly kid-flick, hop on over that fence and swing into the cinema, posthaste. I think you'll be glad you did, as would an entire family. Now, it's unlikely that you'll cry, as I nearly did somewhere in the final ten minutes, but I do think you'll enjoy yourself, be pleasantly surprised, and all the more eager for Warner Bros' forthcoming 2018 re-telling, Jungle Book, helmed by Gollum/Caesar/Supreme Leader Snoke himself, Andy Serkis. It promises to be precious.